Due to the destruction of 1943, the city was almost completely rebuilt in the 1950s. Hence there are very few old buildings in the centre. The oldest monument is the "Druselturm". 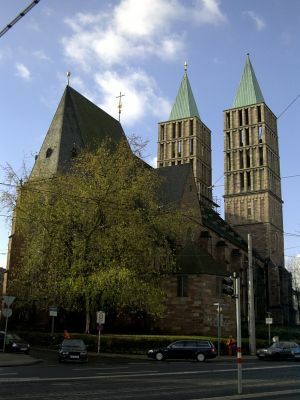 The "Brüderkirche" and the St. Martin Church are also in part of medieval origin, but the towers of St. Martin are from the 1950s. What historic buildings have survived are mainly outside the center of town. 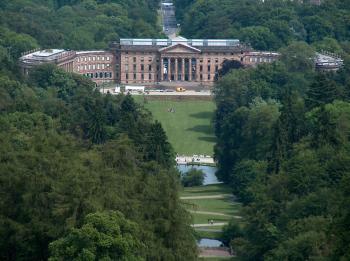 Wilhelmshöhe Palace, above the city, was built in 1786 by landgrave Wilhelm IX of Hesse-Kassel. The palace now is a museum and houses a world-famous wall paper collection. It is surrounded by a beautiful park with many appealing sights. The Oktagon is a huge octagonal stone structure carrying a giant replica of Hercules by Benvenuto Cellini. 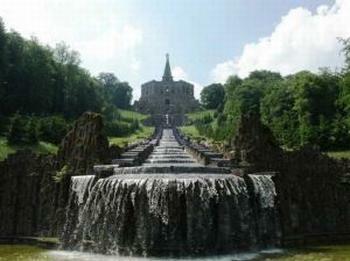 From its base down to Wilhelmshöhe Palace runs a long set of artificial cascades which delight visitors during the summer months. 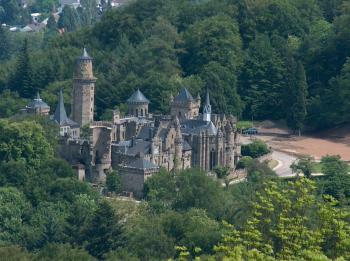 The Löwenburg ("Lions Castle") is a replica of a medieval castle, also built during the reign of Wilhelm IX. After the Franco-Prussian War of 1870/71 Napoléon III was imprisoned in Wilhelmshöhe. In 1918 Wilhelmshöhe became seat of the German Army Command (OHL): it was there that the military commanders Hindenburg and Ludendorff prepared the German capitulation. Another large park is the Karlsaue along the Fulda River. Established in the 16th century, it is famous for the Orangerie, a palace built in 1710 as a summer residence for the landgraves. Today there is also a planetarium in the park. For more pictures visit my German version.